Greek salad, a Sunday tradition. It’s part of the Sunday ritual, so deeply ingrained that the weekend hardly feels complete without it. Every weekend, we make our shopping list, and every weekend, the same few ingredients appear: cucumber, tomatoes, red onion, feta, black olives. 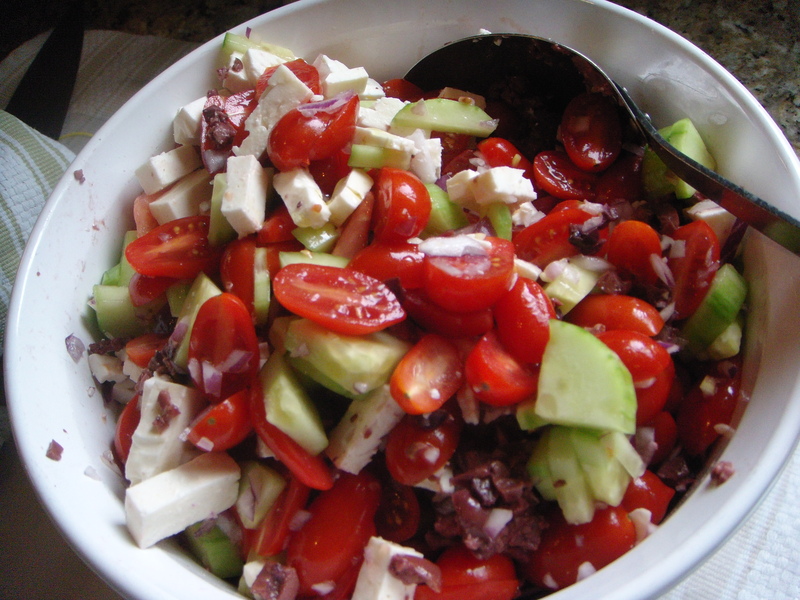 our Greek salad serves as a side dish on its own, but more commonly I use it to top my chopped lettuce during the week. Every night. Yes, I eat salad every night during the week. I think of it as a calorie bank: I save up calories during the week that I can in turn spend on weekend splurges. The essential component to our Greek salad is English cucumber, peeled. I find the seeds and skins of traditional cucumbers to be bitter and generally horrible. In fact, for years I detested cucumbers until I realized their problem could be fixed by peeling and seeding them, and I always question restaurants that slice cucumbers on salads without taking these extra steps. Grape tomatoes are the other important component of the recipe. During the summer, if large, flavorful tomatoes are available, I’ll use them, but grape tomatoes are usually delicious, if a little expensive, year round. So, peel, quarter and chop the cucumber, add a little salt. Halve the grape tomatoes lengthwise and add to cucumber. Finely mince 1/2 red onion and give the salad a toss. Though I buy pitted kalamata olives, I chop them to detect any lingering pits. In they go. Cube or crumble the feta and pile it in. Season with salt and pepper keeping in mind that the olives and feta add some saltiness. A drizzle of olive oil is the final touch. If I have a lemon, maybe a squeeze of juice, but I don’t go out of my way to buy lemon. Stir it up, and it’s done. English cucumbers are the way to go. A drizzle of good olive oil. Yum! Time to start chopping, I love all those ingredients. Yum. I just made some! Thanks for the step by step instructions.